ZBrush 2018 is a professional digital sculpting and painting software that allows you to sculpt up to a billion polygons. ZBrush gives you the tools to quickly sketch out a 2D or 3D concept and then take that idea all the way to completion. You can create realistic renders right within ZBrush with lighting and atmospheric effects. Using proprietary "pixol" technology, ZBrush is able to store lighting, color, material, and depth information for all objects on the screen, allowing renderings to be viewed in real time. Global or local changes can be made to your models. Medium and high frequency details that were traditionally painted in when bumps and wrinkles were applied to an object's surface can now be sculpted. High frequency 3D models may also be projected onto the background of a scene, where they become a 2.5D image. A 2.5D image is used to simulate the appearance of being three-dimensional, when in fact it is not. Upon this 2.5D background image, further effects may be applied, allowing another 3D model to be composited into the same scene. With the many powerful export options, you can easily prepare your model for 3D printing or use within any other digital application. Sculptris Pro is a dynamic tessellation sculpting workflow that enables you to ignore the constraints of polygon distribution and just sculpt. Sculptris Pro makes it possible for you to begin with any shape or model, whether it has ten polygons or ten thousand. There is absolutely no need to worry about having enough polygons to capture details. With Sculptris Pro you can simply brush across the surface. Sculptris Pro will dynamically add and reduce polygons wherever and whenever it's needed, freeing you to focus entirely on the look you're trying to achieve. Start with a sphere, cube, cone, or any other mesh. PolyGroupIt provides an entirely new way to create the polygon groupings that are so essential to a smooth workflow. PolyGroupIt accurately evaluates the surface of a model in real-time, generating intelligent groupings with a single button click. With PolyGroupIt you can delete, add, copy, paste, grow, or shrink, create PolyGroups symmetrically, and even use PolyPaint to trace out exactly what you want your PolyGroups to look like. DynaMesh has no limitations to what it can become. Starting from a sphere to create a character head is an easy process, but DynaMesh will allow you to create a whole character from that very same sphere with no uneven geometry. Consider what it's like to work with clay. As you stretch clay out or add volume to it, the clay itself retains the same basic consistency and the same capacity for detail across its surface. DynaMesh brings that experience to the digital world. The power behind DynaMesh is its ability to regenerate geometry in a blink of the eye, removing all stretched polygons by creating a surface optimized for sculpting and with equal distribution of polygons across the surface. Stretch your model to create legs, arms, columns, or whatever else comes to mind. There are no limits to what your starting point can evolve into. Shadow Box brings limitless control to the process of creating your three-dimensional base meshes. Use the advanced masking brushes to paint a silhouette of your idea on any of the three sides of Shadow Box and a mesh matching that profile will appear at the center. Carve out holes in the surface of the mesh by simply erasing any part of the masks; the surface at the center of Shadow Box updates instantly. Combine radial symmetry, your own custom alpha textures, reference images, and masking curves to build complex forms in a matter of seconds. Whether you are sculpting a specific model or just exploring shapes, Shadow Box offers a unique method for quickly establishing an editable base mesh for sculpting. ZSpheres allow you to quickly create a base mesh with clean topology, which can then be sculpted into any form. The power of ZSpheres lies within their simplicity. From a single ZSphere you can easily grow new ones, which can then be scaled, moved, and rotated into any form. Now you can enjoy creating the geometry for your characters while posing in real time. When creating with ZSphere you don't have to worry about complex arrangements of limbs and appendages. At any point, you can add or remove ZSpheres to your creations. You can also instantly preview the mesh that you will generate. Once you have finished building your model with ZSpheres you can generally clean a mesh with a single click. A good pose is the essence of a great composition. Rhythm, gesture, weight, and balance are all key to any work of art. Use the Mannequin sample projects included with ZBrush to find just the perfect pose for single or multi-character models. The ZSphere Mannequins can easily be edited to fit any character or creature you need. Create an entire scene in just a few clicks. Mannequins are essentially ZSphere armatures. The way that you interact with them allows for easy posing, so that you can quickly explore your ideas - faster, in fact, than sketching a concept image and with far greater flexibility for change as you go. The great thing about using Mannequins is that you don't have to model anything; the model is already set up and ready to go. Later on, if you need to you can skin the Mannequin to make a mesh that you can sculpt. Several Mannequin scenes are included with ZBrush. It is also simple to create your own to infinitely expand your library. There is a wide range of attributes that can change the initial state of a ZBrush Primitive. This gives you a great level of control over the shape of the Primitive you start sculpting with. Quickly and easily change a cone into a torso or a single plan into any shape you can imagine by using ZBrush's curves. Curves are used within ZBrush to make editing intuitive and more powerful. This is also the case with ZBrush Primitives. By editing a Primitive's curve, you can create an endless number of shapes with both rounded surfaces mixed with hard edges. Add as many points of control along a curve to make shapes as complex as you want. Curve mode in the Stroke palette allows you to apply your brush strokes with all their settings and modifiers along a defined curve. This curve can be drawn out along the surface of your sculpt or even continue the curve off your model to create integrated pieces like horns, arms, fingers and much more. This one-click function will apply a topological modification to your model to alter the geometry by sharpening its edges. It can also create a clean surface between two sharp-angled edges. By modifying the Clay Polish parameters, you can drastically change its result. For example, it can give your model a clay weld look, as if the two pieces were welded together. Clay Polish can be combined with DynaMesh. This further enhances the feel of real clay sculpting in ZBrush, making it look even more like you're adding real clay strips to the surface. The Insert Multi Mesh Brush acts like the standard InsertMesh brushes except that at any given time, you can press the M key to view a list of associated meshes ready for insertion into your model. All of these models are actually a part of the brush and you can switch between them at any time. Think of it as a toolbox composed of your very own 3D meshes with the capacity to function as insert brushes. This means less clutter in your Brush palette while simultaneously letting you build libraries of shapes ready for use at the click of a button. For example, one brush can hold various screws and rivets for sculpting mechanical objects. Another brush could be nothing but noses. Insert Multi Mesh brushes also utilize ZBrush's curves to accomplish things like drawing a line of evenly spaced rivets along a fixed plane. Tri Part Multi Mesh Brushes uses the inserted mesh's PolyGroups to define end caps and a repeatable segment. When you draw a curve, ZBrush will then place specific elements at the start and end of the stroke while duplicating a third element along the entire length of the curve between those end caps. With this new feature, you will have the ability to easily create complex zippers, chains, straps, and more with speed. The newly drawn out components will conform perfectly to a surface. These design elements are based on an editable curve whose shape, size, and length parameters are entirely up to you. It's another way to maintain artistic and creative control inside ZBrush. ZBrush features over 30 start-up brushes to sculpt with and the ability to create an endless assortment of your own custom brushes. The wide range of brushes are designed based on the feel of natural brush strokes and were created with real-world sculpting techniques in mind. Furthermore, with tools like Symmetry, Repeat, and hundreds of other custom controls, you can sculpt details like stitching in fabric, hard mechanical edges, and much more. 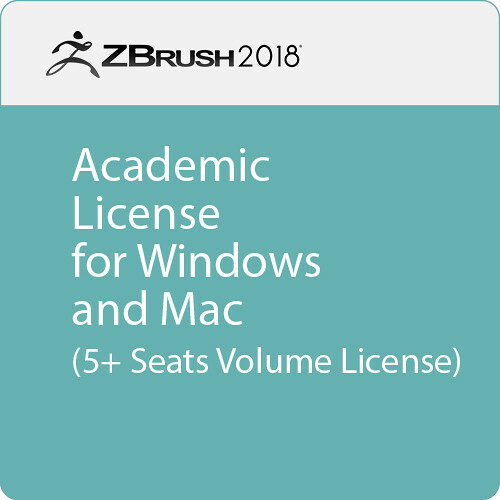 The collection of 3D brushes includes brushes that will allow you to instantly add a nose or ear to your mesh or even use the new CurveMesh brushes to draw out lines of geometry. The SliceCurve brush allows you to slice your model while adding new faces along the cut and creating two different PolyGroups at the same time. When used with DynaMesh and the Group option, SliceCurve will create independent parts of a model, ready for manipulation. The Curve Fill brushes allow you to draw a curve, and, with the release of your cursor, the stroke is converted into a closed shape. The Curve Lath brush will create a revolution-based mesh from your drawn curve. This is a way to quickly create a base mesh or even props in just seconds. Even the shakiest of hands will have tremendous control over the direction of their strokes. By enabling Lazy Mouse while sculpting in ZBrush, you get surgical accuracy as you brush across the surface of your model. Sculpt with smooth flowing curves or make perfectly straight lines across your surface. Whether you are using a mouse or a tablet to sculpt inside ZBrush, Lazy Mouse and its many settings give you the precision you need to create any style of strokes quickly and easily. Use the freehand stoke to brush across the surface the way you would in real life, or switch your stroke type to gain even more control over the surface you are sculpting. Use the spray stroke to add a random spray effect as you sculpt. The Drag Rectangle Stroke allows you to draw out exact details like skin pores all the way to sharp mechanical parts. Using different alphas as you sculpt gives you a lot of control over how you deform your surface. Create realistic wood grains, scaly skin, feathers, and much more. You can use the many alphas that come with ZBrush or use any image to create your own. In addition to the many controls available to you over your brushes, you also get the ability to edit the shape of your brush. The easy to use curve allows you to precisely change the shape you sculpt into the surface. You can even create curves that transition between hard edges to soft rounded ones. Gravity allows simulation of gravity, wind, magnetism, or other directional effects that 'pull' (or push) at the surface of your model. When gravity is on, your regular sculpting will be modified by a pull in the direction of the gravity. Imagine windblown cloth, or the heavy folds of elephant skin. Masks protect surfaces, giving greater control as you work. They can also be used to define parts of your model that you wish to extract into a whole new object. They are at the heart of Shadow Box, ZBrush's silhouette-based mesh generation tool. ZBrush offers five masking brushes: Mask Circle, Mask Curve, Mask Lasso, Mask Pen, and Mask Rectangle. Each of these offers specialized and highly useful ways to paint masks onto your figures. And because these are brushes, they are also able to take advantage of all the same brush modifiers that you use for sculpting. This brush moves points on the surface to add volume, analyzes the existing topology, and relaxes the polygons to minimize stretching. There are four such brushes, each for a different need: Move Elastic, Move Parts, Move Topological, and Move TopoElastic. Clip brushes add precise refinement to the shapes and surfaces of your mechanical objects, vehicles, and character armor. Use them to slice your forms with accuracy and hone their edges to absolute perfection. The Curve, Circle, and Square stroke types can be applied to the Clip brushes to ensure that your surface has straight edges or for creating realistic detail. These brushes don't simply cut the mesh, leaving big holes for you to then fill in. They actually move the existing points, snapping them to the plane defined by your brush stroke. The result is that your existing topology remains perfectly intact and your clip produces a perfectly capped edge. The MatchMaker brush deforms the shape of a surface so that it fits perfectly against other objects. Within seconds you can craft complex parts and make them all fit perfectly together. Remesh and reproject to create any topology you need, then use the MatchMaker brush to fit these parts together perfectly. MatchMaker is the ideal brush to deform your mesh to conform to other 3D models. SubTools allow a single (logical) mesh to be treated as many independent objects. Like PolyGroups, they split a single model into several different components, but the emphasis in SubTools is allowing you to work with each component as if it were a separate mesh. SubTools increases the number of polygons you can work with by allowing each SubTool to have as many polygons as your system can handle. For example, if your system can handle 8 million polygons for one SubTool you can have a model equal to 32 million polygons by having 4 SubTools of 8 million polygons each. As you work on a complex project it doesn't take long to find yourself with a long list of parts in the SubTool palette. After a while it can become challenging to find specific pieces or see how everything is fitting together. Xpose moves your SubTools apart in the 3D space so that you can easily isolate the pieces. It gives you an exploded view, just like you'll find on technical drawings. Xpose is also a presentation tool. Show the model rotating as a turntable, then having the pieces fly out to show the exploded view. Each SubTool's visibility can be turned on and off, letting you see just the parts that are necessary for what you're doing at the time. However, you will also often encounter situations when you have some SubTools visible, some hidden, and now want to focus on a single one of the visible parts. When that happens, it can be a break in your workflow to temporarily hide several SubTools, do what you need, then unhide those same SubTools again. The Solo feature resolves this challenge by instantly hiding all other SubTools, regardless of their status in the SubTool palette. You can select any SubTool, press Solo to hide everything else and go right to work. When you want to see the rest of the model again, turn Solo off. Everything that had been visible before turning Solo on will be visible once again, while everything that had previously been hidden will remain hidden. To create a base mesh for your sculpting in ZBrush you can use ZSpheres, ZSketch, ShadowBox, Dynamesh, or import a model from another 3D package. Another solution is to do a Remesh of a model or a set of different objects. The Remesh method creates new geometry with a new topology, but as much as possible of that topology is based off the original model(s). One or more SubTools can be remeshed and modifiers applied to perform Boolean operations (Add, Subtract, Intersect). Remesh can also make use of Symmetry for advanced results. Mesh extraction is a fast and powerful way to create new parts to your model. Using existing geometry, you can quickly and easily create a jacket, a helmet, gloves, and most anything else your character may need. Mesh Extract works by isolating parts of one model and, in a sense, duplicating that as another mesh. It also 'cleans' the edge of the extracted mesh to create a smooth, even boundary. Just paint a selection on the area you want new geometry to be created from and simply extract. Layers allow for a non-linear workflow. You can work with a model at many different stages of development simultaneously. You can add details such as a reptile skin scales, then turn those details off and refine the major forms underlying them. If a director is calling for more damage on a piece of armor, simply dial up the intensity of that layer. If you want to see that same mesh without any damage at all, just turn that layer off. Surface Noise gives you control over the look and feel of your 3D surfaces. You can apply a wide variety of noise types directly to any surfaces regardless of polycount while maintaining the strength, size, and color of the noise you want to work with. Surface Noise gives you the ability to create looks that would be impossible or too time-consuming to model. You can apply noise to your whole model or only to the selected areas. Create rusted metal, stucco, chipped paint, battle damage, and more. Create realistic poses to abstract deformations with ease. Transpose lets you quickly isolate parts of your model, which can then be deformed, positioned, scaled, and rotated with high accuracy. There's no need for complicated rigging or tedious painting of weights. Just select and pose. Achieve realistic muscle deformation as you bend a limb into a flexed position, then quickly return your geometry back to its original position. Transpose gives you the freedom to explore 3D sculpture in a new and natural way. The deformations features inside ZBrush allow you to easily apply twist, stretch, bend, and a variety of other unique changes to any 3D mesh. With over 20 powerful deformation types that can be applied in any axis, you have the ability to create advanced shapes with just a few clicks. By using the power of ZBrush to deform millions of polygons with ease, you don't have to worry about how complex the shape you want may be. Just deform it any way you like. With the ability to divide your model up to a billion polygons, you can focus your attention on a specific area of your 3D creation while ZBrush handles the rest of your model in a very system friendly way. ZBrush's powerful memory handling allows you to sculpt with virtually no limits. Projection Master allows you to use all of the 2D and 2.5D brushes in sculpting, texturing, and otherwise working with your 3D model. The concept behind it is simple. While working with a 3D model (usually a very high-resolution one, as the more "standard" 3D tools are usually used when sculpting low- and medium-resolution details), you activate Projection Master to convert the visible portion of your model into pixols on the canvas. With FiberMesh, you can use exportable hair and fur, as well as grow plants, weeds, shrubs, and more. Simply mask an area to define where the fibers will grow. Use the various FiberMesh features to quickly define your look. You can even use PolyPaint information to generate a wide range of colored fibers. FiberMesh offers the ability to see what changes you are generating in real time as you work. From the earliest stages of your project's development, you will interactively see and modify the size, thickness, flare, and gravity associated with your fibers. MicroMesh allows for ZBrush's rendering system to replace a generated FiberMesh or a model's individual polygons with any other 3D mesh. The NoiseMaker plug-in will allow you to accurately create 3D noise with a wide variety of parametric generators. Take the surface detail of your models further with camouflage, scales, hex tiles, and more inside NoiseMaker. Use NoiseMaker to affect sculptural changes too. When using NoiseMaker in conjunction with features like masking and alphas, your possibilities increase dramatically. Load images to be applied as alphas inside the surface noise maker preview window, gain an unparalleled level of refinement, and generate surface texture in a fraction of the time. With Panel Loops you can convert your model's PolyGroups into panels of polygons with or without thickness, or even as extruded surfaces. The edges of these panels are created with a custom bevel around them defined by an editable curve. This is a great companion to ZBrush's existing Mesh Extract feature, providing advanced control over the final result. Borders will have clean polygons loops even on low resolution models. They can have inner or outer panels (or both) and can be created as an extrusion from the original surface or as entirely separate pieces. The Delete Loops command analyzes your model's topology based on a user-defined angle setting. With a single click, it removes all unnecessary edge loops — polygons that don't contribute to the shape of the model. Not only is this useful for artists who must work within a polygon budget (such as game designers), it also allows you to push your high-resolution sculpting further. After all, unnecessary polygons add up quickly when you subdivide your model several times. A companion to Delete Loops, Align Loops uses the same settings but doesn't actually remove any polygons. Instead it moves them to what you would get if you used the Delete Loops function. In this way, you can push the settings to their extremes in a non-destructive manner and quickly explore new directions. The Deformation sub-palette features Relax options, including Polish by Feature, which intelligently improves your mesh's shape without sacrificing volume. It produces results by analyzing the model's PolyGroups, creasing and split areas. The Curves Frame Mesh option can now create curves based on the model's PolyGroups, creased edges, or outline. These curves can then be used with any of the curve-based sculpting brushes like Curve Multi Tube or even QRemesher Guides. PolyPainting allows painting on a model's surface without first assigning a texture map. A texture map can be created at a later time, and the painted surface can be transferred to the map. PolyPainting offers significant advantages compared to a standard workflow. The resolution of the texture map need not be decided in advance. This is particularly valuable if you find you need more detailing on an area than you thought you would. Instead of repainting a new, larger texture map, you can simply transfer the existing surface painting to a new, larger map, with no rework necessary. Similarly, the UV unwrapping need not be fixed in advance. The SpotLight painting system enables image editing in ZBrush and then allows you to project the image to the surface of the model using the intuitive sculpting and painting brushes. SpotLight goes beyond being just a texturing tool. Imported images can be altered, layered, and precisely positioned. Adjust the hue and intensity, color match other images, clone, tile, and color key to create entirely new images. UV Master is a free plug-in which will create very efficient UVs for your models with a single click. Because the UV maps generated by the plug-in can be in one UV island you will be able to understand your model's UVs in any 2D image editor and paint or edit them like you would do with manually unwrapped UVs. UV Master provides several utilities. Flatten and unflatten the model's UVs for easy visualization. Copy and paste UVs between models of the same topology. Create UV islands based on PolyGroups. Load a model with existing UVs and/or seams to unwrap it using the UV Master algorithm. Use the specialized Ambient Occlusion calculation to attract UV seams to the less visible parts of the model. Use your favorite panoramic images as a background in ZBrush and integrate your model into the environment's lighting and coloring at render time. Whether your image is 8-bit or full HDRI, using it as an environment is one click away. You have complete control over this environment including changes in longitude or latitude to choose your point of view. To improve the integration, the default ZBrush floor grid is treated as a shadow catcher, creating an invisible ground plane which will receive the object shadows. Simply load your background image, select an appropriate material, and render the next masterpiece. LightCap Designer is a real-time material light modifier. In very little time you can create scene lighting from an environment, create lights with alpha shapes applied, and even add texture to a light to fit the needs of your render. You can even create lights and then use the LightCap Designer to convert these to an environment for your render, resulting in more accuracy and allowing more creativity in your process. In ZBrush, the appearance of any surface is affected by several things: its base color, its texture image (if it has one), the lighting that falls on the surface, and its material. The material changes the way the lighting reacts with the surface so that it may appear, for example, shiny, bumpy, reflective, metallic, or transparent. There are many preset materials in ZBrush to give you control over a scene. In addition, each material can be modified to create new materials. What if you could create a surface material and lighting environment simply by painting an object so that it looks like you want it to look? What if you could create that surface material by sampling points from an existing image that already features the material and lighting environment you want? For a great many materials and lighting environments, this is exactly what MatCap (Material Capture), allows you to do. Furthermore, you can dramatically refine MatCaps using just a few new sliders: change hue, saturation, orientation, and much more. This can be done with the MatCaps you create or any from the library in the DownloadCenter. Any one MatCap offers thousands of possibilities. Once done creating your materials, use the new Wax modifier to add an effect to your model that resembles Subsurface Scattering. A single slider adjusts the material's temperature to be cool or hot. The ZBrush render engine features a 32-bit kernel and produces highly accurate renders and images. Thanks to the BPR filters in ZBrush, you can make many adjustments directly within ZBrush. Add Sharpness to the whole scene or just the model. Add a Depth of Field filter on top of that. Finish things off by changing the shadow colors with a Color filter. All this while remaining in ZBrush. These BPR filters can affect Shadows, Ambient Occlusion, Mask, Fresnel, Subsurface Scattering, and much more. The animation timeline allows you to create moving turntables for your demo reel. Animate poses, store camera positions, sync your animation to music, import audio to test blend shapes and lip sync. More than simply an animation tool, the timeline can also be used to store and switch between your model's states for fast, easy control while working. For example, you can use points on the timeline to swap visibility of entire groups of SubTools. Take rendering even further with Vector Displacement Maps. You'll benefit from the ability to displace the surface in any direction, including undercuts. That's just the start. You can export sculpted details from your ZBrush models to other 3rd party applications and make use of file types like .tiff (16-/32-bit) and .exr (32-bit). ZBrush comes fully equipped to handle both 16-bit and 32-bit displacement map output. ZBrush puts celshading at your fingertips with new Posterize render features. Give your models a new look with full control over gradients and steps in real time. Posterization can also be applied to Materials and Curves via the curve modifiers settings. This means you can assign different Posterization effects to multiple materials and modulate the effect of Posterization in the Specular, Diffuse Color, and Environment Color channels. The Outline function applies an illustrative touch to your final image. Outline also works with the Material Mixer and as a post-render effect in conjunction with BPR filters. With GoZ there is no need to invest time in setting up shading networks for your normal, displacement, and texture maps. With a single click of a button, GoZ will transfer your mesh to a GoZ-enabled application of your choice and instantly set up all the appropriate shading networks for you. Upon sending your mesh back to ZBrush, GoZ will automatically remap the existing high-resolution details to the incoming mesh, even if you've significantly changed the topology in your other application. GoZ™ will take care of simple operations such as correcting points and polygons order, as well as more advanced operations that require complete remapping. The updated mesh is immediately ready for further detailing, map creation, and transferring to any other GoZ-enabled application, such as Autodesk Maya. Decimation Master allows you to greatly reduce the poly count of a model while preserving the high-resolution detail. You can interactively choose up to what percentage you optimize different areas of your mesh. This gives you a high level of control over how you preserve details while lowering your poly count. As your ZBrush creations become more complex, you'll find that saving all the meshes, textures, alphas, materials, timeline animation, and camera positions at once is easy thanks to the new ZProject format. When you load a saved ZProject in ZBrush, you'll be able to pick up exactly where you saved as if you had never left. Save all loaded tools, document size, light settings, materials, timeline components, and render settings with a single click. At any time, you can restore your current project to its originally loaded state or its most recently saved state simply by clicking the Revert button. Unlike ordinary pixels found in other 2D applications which contain only color and position information, ZBrush's "pixol" contains color, position, depth, lighting, and material information. If you decided to paint what seems to be a 2D illustration of a tree in ZBrush, but then decided that you want to change the lighting to be more like sunset instead of midday, just change your lighting controls and all of the shadows are updated in real time. There are also no limits to the number of polygons you can use in your illustration. Maybe you want to add a 3D building to your image that is around 20 million polygons. While working in 2.5D you can add and duplicate that 3D model as many times as you want, creating an entire city with an infinite number of buildings without ever causing a slowdown in your system. Then finalize your city with atmospheric effects and an arsenal of brushes and filters. PaintStop configures your user interface and settings to give you a feel of using real-world art tools. In addition to the many brushes, pencils, and paints that are available in PaintStop, you can choose from a variety of different canvas types to change the look and feel of your final piece. what is the ordering process for purchases from Australia with regards to academic version of the program?